The Frankfurt Book Fair in Germany just ended. It’s a major event in book publishing. My fellow Apocalypsie, Lenore, took this photo of my foreign agent Heather holding a card stock giveaway with info about STARTERS. Wouldn’t you want to buy anything from her? Ice cream? An island in the Pacific… or maybe a book. We’ve already sold thirteen territories before the fair and hopefully more soon. The Random House booth! 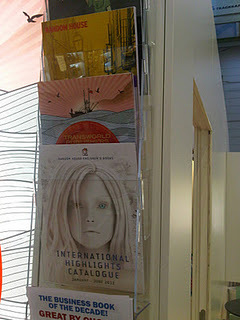 These are international highlights catalogues to show what territories are already sold for their upcoming books. The children’s titles one has STARTERS on the cover. Note to self: get copy for scrapbook. I have just received my copy edits from the publisher, so I will be really, really busy. I’ve already been just busy so if you don’t hear from me, you’ll know why. 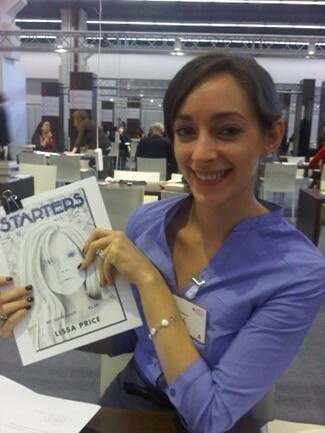 You can always catch me (briefly) on Twitter – http://twitter.com/#!/Lissa_Price. Previous Post: STARTERS Cover Reveal! You’re welcome! Was so nice to chat with Heather. She’s fab!! This is so exciting Lissa! I really can’t wait til your book comes out! Fabulous–STARTERS on the cover of the catalogue. Gotta love seeing that! God speed with your edits. Congrats on earning the cover of the catalogue, and best of luck with the edits.